My kiddos love baked turkey meatballs! This is a good thing because they’re easy to whip up, and they make great leftovers for school lunches in a Thermos. Since I love finding shortcuts in the kitchen, I bake these delicious orbs of goodness on parchment-lined baking sheets, which prevents the splattered mess that typically occurs when you cook meatballs on the stovetop. This makes me happy. In a medium-sized bowl, use your hands to combine the meatball ingredients. Roll the mixture into 1½-inch balls. Line a baking sheet with wax paper. Place the meatballs, evenly spaced, on the sheet, and place it in the freezer. When the meatballs are frozen very firm, transfer them to an airtight container or a 1-gallon freezer bag, and freeze until needed. In a medium saucepan, combine the sauce ingredients. Heat the mixture over medium heat until the sauce begins to boil. Reduce the heat to medium-low, and simmer for 5-10 minutes or until the sauce thickens a bit. Remove the sauce from the heat, and let cool for 15 minutes. Pour the sauce into mason jars, cover them, and place them in the refrigerator to cool completely. Once the sauce is cold, store the jars in the freezer until needed. Thaw the meatballs and the sauce in the refrigerator overnight. When ready to cook, preheat your oven to 400°F. Placed the thawed meatballs on a parchment-lined baking sheet, and bake for 20-25 minutes or until cooked through. Meanwhile, in a medium saucepan, heat the thawed sauce on medium-low until warm. 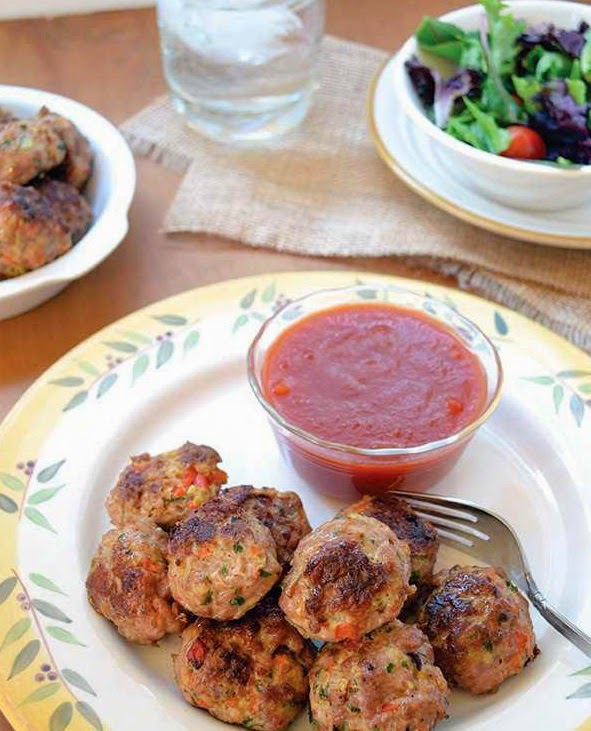 Serve the hot meatballs with a bowl of sauce on the side for dipping.